Ashley Crowder is a native Charlottean. While growing up in Charlotte, she attended Paw Creek Elementary, Piedmont Open Middle School and graduated from West Mecklenburg High School as salutatorian. She left North Carolina to pursue undergraduate studies at Tulane University of New Orleans, where during her freshman year Hurricane Katrina devastated the city of New Orleans and the Gulf Coast, forcing her to return home for the fall semester. While back in North Carolina, Ms. Crowder attended Belmont Abbey College where she discovered Psychology and became fascinated with human emotions, particularly resiliency in children and adolescents. Upon returning to New Orleans, the revamped curriculum at Tulane provided a multitude of community service opportunities that emphasized the dramatic need to help the city restore itself within the new reality of a Post-Katrina world. Ms. Crowder was also a member of Phi Sigma Pi National Honor Fraternity. These experiences coupled with completing a degree in Psychology with a focus on children and adolescent psychology, lead Ms. Crowder to pursue a developing passion for working with families in law school. While attending Maurice A. Deane School of Law at Hofstra University (formerly Hofstra University School of Law), Ms. Crowder was an Associate for the Center for Children, Families, and the Law, and served as Managing Editor of Articles for the Family Court Review Vol. 50. During her law school tenure Ms. Crowder received a Public Justice Foundation Fellowship that allowed her to intern at the Nassau County Department of Social Services. During her year interning at Social Services, Ms. Crowder encountered many families in crisis and developed a strong ability to empathize as well as assist in problem solving to get at the root of a family's problems rather than just treating the symptoms of an underlying conflict. Ms. Crowder was an inaugural student in the Juvenile Justice Clinic, which helped families navigate the complexities of School Suspension Hearings and Committee on Special Education Meetings. Upon graduation from law school Ms. Crowder returned home to Charlotte to grow her career in her hometown. Ms. Crowder began her career in the real estate field. 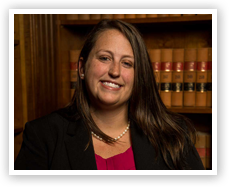 Ms. Crowder focuses her practice on family law cases: divorce, child custody, child support, alimony and equitable distribution and other matrimonial law matters. Ms. Crowder is interested in working with families especially in custody matters where the family can work together as a team to develop the best outcome for the children. When Ms. Crowder is not working she enjoys catching up on the latest novel on her long reading list, spending time with her niece, and trying out delicious new recipes for her friends and family.